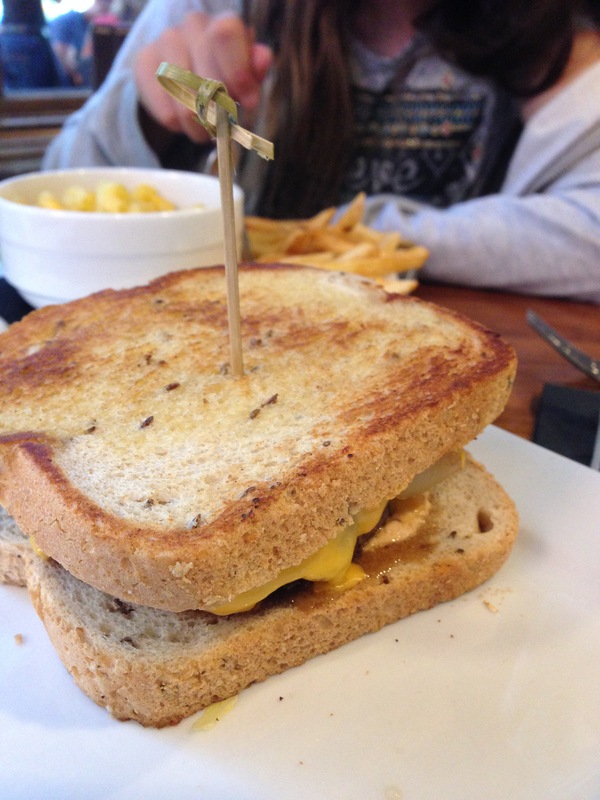 Bru Burger Bar – 410 Massachusetts Avenue Indianapolis! Well, after a nice family afternoon of watching the time trials for the Indianapolis 500. In case you didn’t know it is the 100 year anniversary of the race at the Indianapolis Motor Speedway. We needed to grab a bite before heading home and decided to head to downtown Indy and this was the direction our parking space took us. (Not everyone gets to go left…racing joke?) 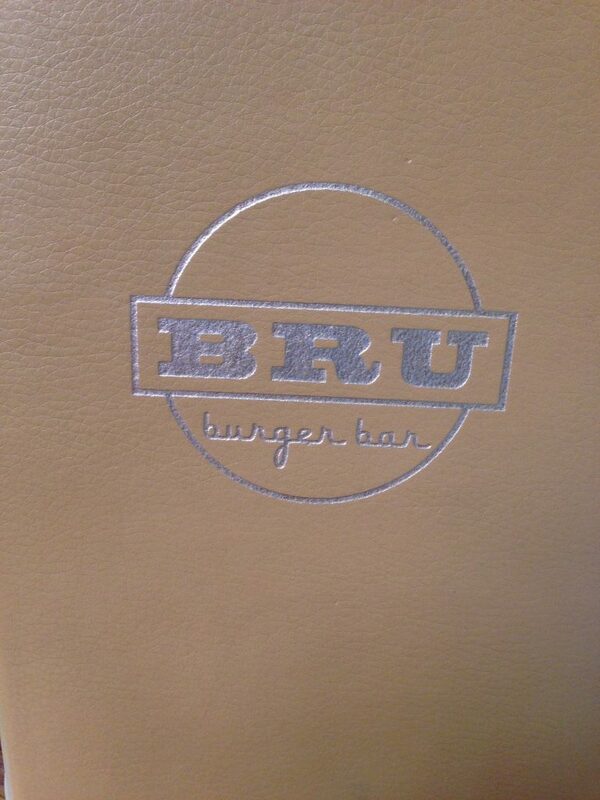 We didn’t want to wait too long or go somewhere too elaborate so we decided on Bru Burger Bar. This is part of the Cunningham restaurant partnership and I’ve been here before. I’d would describe it as an upscale burger place. Why you might ask? Well, it is on Mass Ave and the list of burgers includes but is not limited to the Bourbon Burger (Bacon, Peppercorn-Bourbon Glaze and Horseradish Havarti) I had this the last time I was here, Drool! There is the Provencal Burger (Basil Aioli, Marinated Red Onions, Herbed Goat Cheese and Sautéed Mushrooms) I’m allergic to mushrooms so this would never be on my list. Ahi Tuna Burger, Viking Farms Lamb Burger, and Vegan Quinoa Burger…you get the point. The prices are very reasonable with most items being between $8 – $12 and the service here is extremely good. At least I can say so far I’ve had great experiences with it. We put our name on the waiting list and in less than 4 minutes we had a seat. There is a very nice selection of craft beers here to go with your burger so I ordered a Bell’s Oberon. 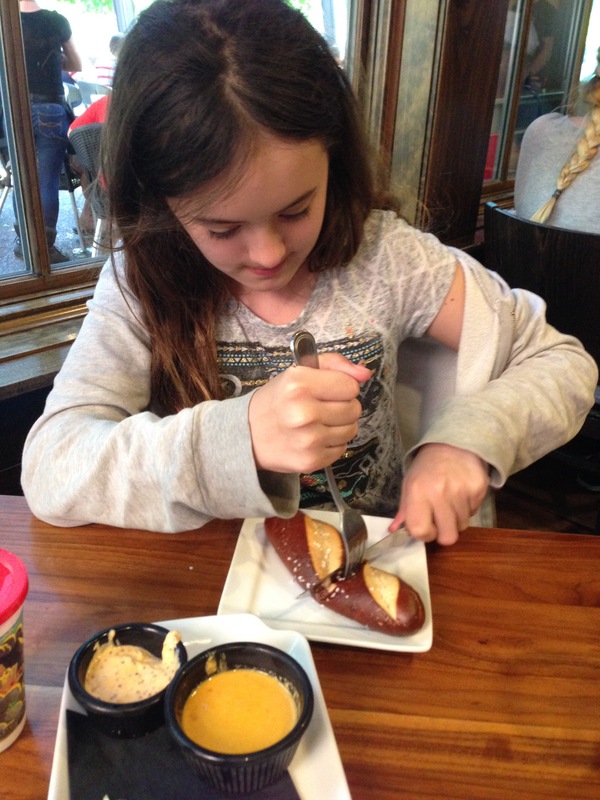 We started with the Soft Pretzel appetizer. It’s my daughters favorite and she would rather have this than dessert. Which is a huge deal because this kid is a chocolate addict. She turned down the S’mores cake for these! What you get are 3 small loafs of pretzel bread with a mustard sauce and a cheese sauce. 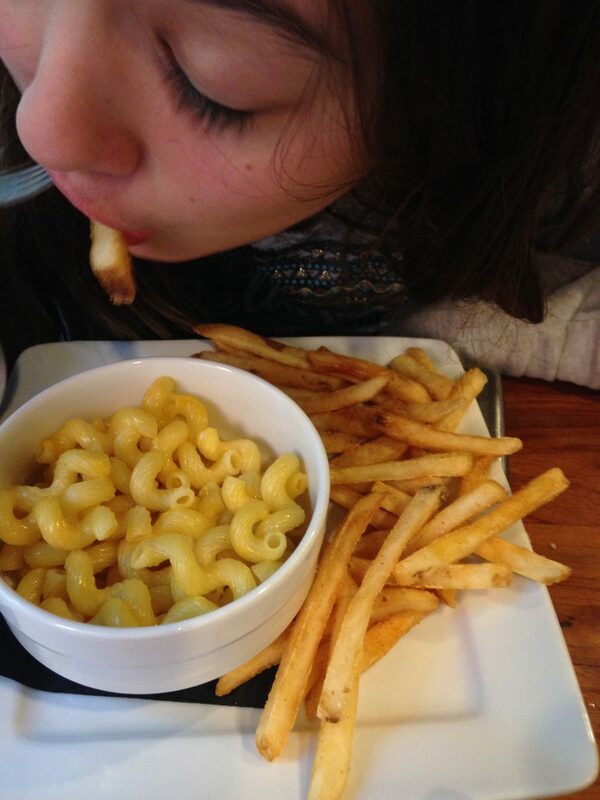 For dinner my daughter ordered the kids Mac-N-Cheese and Fries. As you can see from the photo she loved it. I couldn’t get a photo without a body part in the picture. She says this is some of the best restaurant mac and cheese she has eaten. And my husband and I split a Patti Melt because we ordered the Bru Board appetizer and didn’t have room in our systems to eat a full burger. 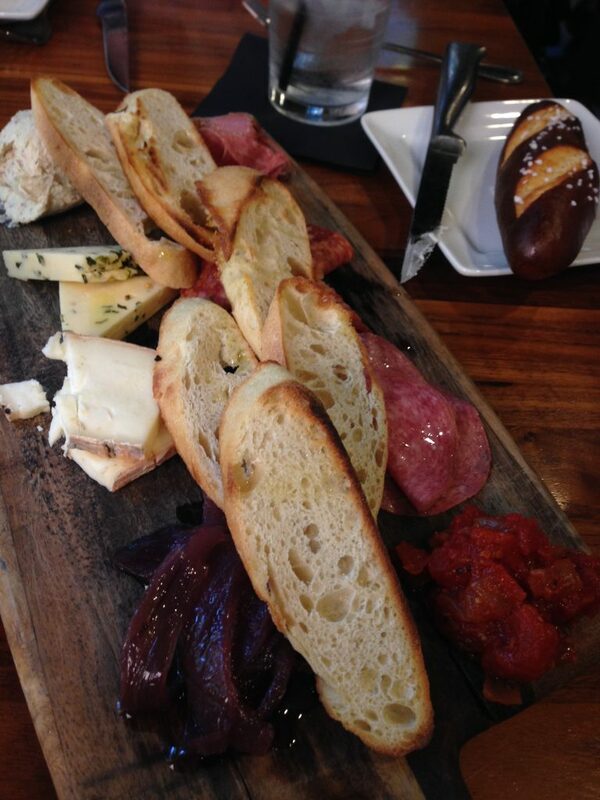 The meat and cheese board consisted of Taleggio cheese, Horseradish Havarti, Bacon-Chive Cream Cheese (my favorite) Prosciutto, salami, and hot Soppressata Salami served with Marinated Red Onions, Tomato Jam and Grilled Baguette. I liked everything but the Taleggio cheese which I can only assume my palate wasn’t sophisticated enough because it tasted like a shoe to me. But, with enough tomato jam it was decent. Again, not my taste but maybe someone else would like it. As expected we were too full for dessert so we had home. Not a bad way to spend a Sunday afternoon and evening. I give this place a thumbs up. I know we will be back. I should add that if you are interested in trying this place out there are locations in Carmel, Indiana, Lexington Kentucky, and Cincinnati Ohio.